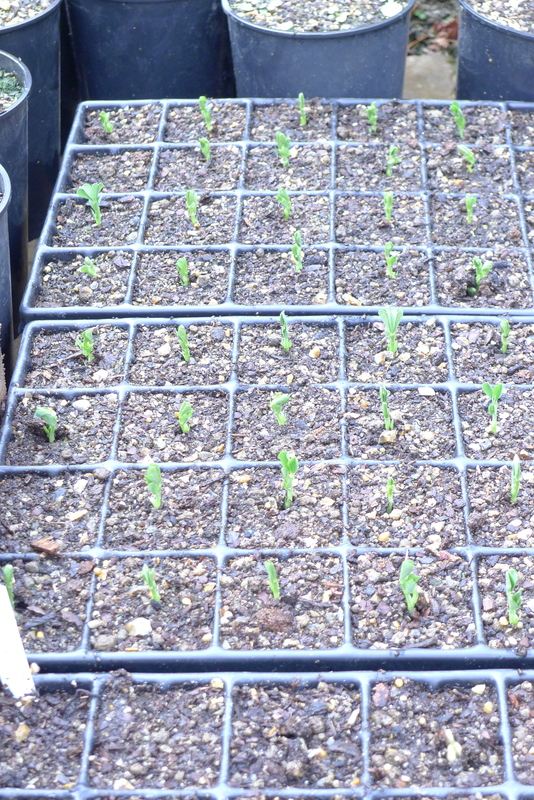 The Pea ‘Sugar Ann” is up, I planted them on the 16/04/13, these were planted into plug trays and placed in the glasshouse next door, a frame will be needed to be put up for support, pea sticks will be used for this. I am about to give up on the sweet peas that were planted, they really are not doing too well, I will use the area of pea sticks that I put up for the peas to grow beans, the seeds can go in today. The Broad Beans are in, I got two strong rows out the three plug trays that I sowed on the 12/03/13 and they have had a nights rain on them, I have planted the plants about 6 inches apart, as with the two rows, I will put support around them as a whole, they really should get going now that they are in the soil. I also got my tray of Shirley Poppy’s in, they where also sown on 12/03/13, I planted them through the soft fruit in the fruit cage, I want them to look like they have self-sown there, if they grow well it is going to give a great lift to the area, I just have to watch for slug problems, slugs enjoy the taste of a young poppy seedlings. I can now have a good restful weekend knowing all this is in, I may just need to water tomorrow if it is hot today……. 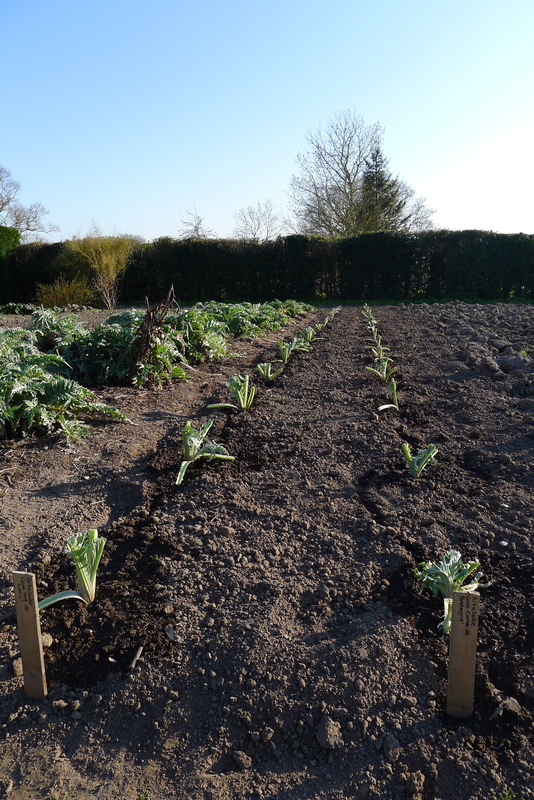 The new bed of Artichokes are in, I lifted the old plants and took slips, most of them had young roots developing so it should all go to plan, I cut the foliage right back and gave them lots of water and am pleased to say we had rain in the night, it will be a great help to them. I am very lucky here because I have Perry Rodriguez, he use to grow the vegetables for Christopher and so I can ask him anything about whatever job I am on, he said something very useful about splitting Artichokes, always plant a few extra somewhere else just in case you have losses. This is very good advice for someone like me who likes to see long, clean lines without gaps. These new plants should start to fruit in late July for us, if you are at Great Dixter around that time we will be selling them from the front door and plants in the nursery. 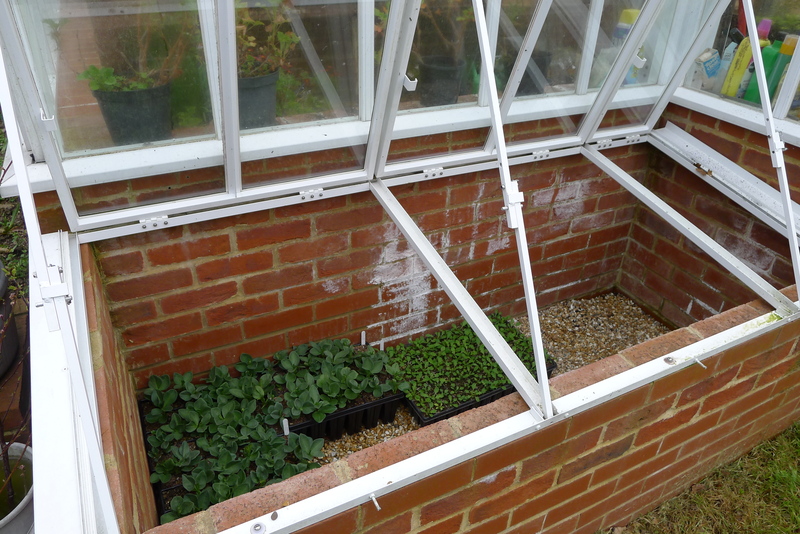 I find it a great feeling when you have spent a day pricking out, look and see all your young plants in the glasshouse, one can sleep well, ( like a barn load of hay in the autumn, you know you are ready for winter). I have four trays of Viola’s, half a tray of Dianthus, one tray of Parsley, half a tray of Broccoli ‘Rudolph, and one tray of Broccoli ‘Summer Purple. 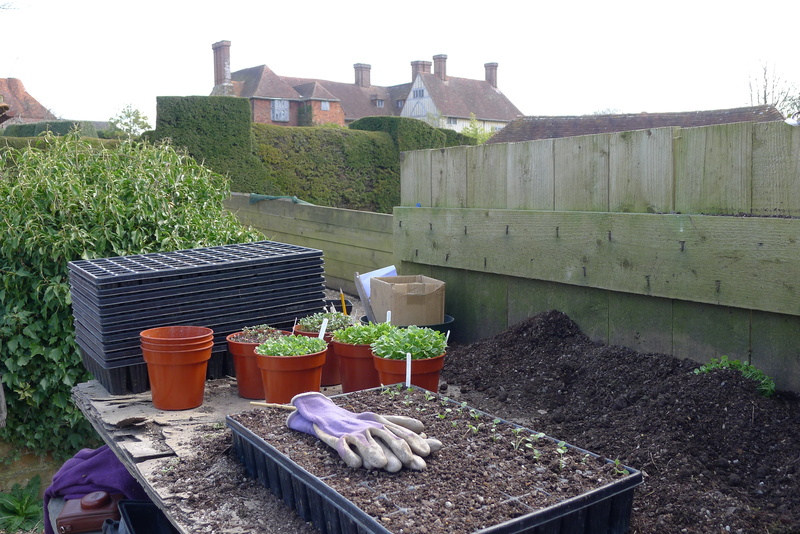 Most of these are from the seed that I planted on the 13/03/13, they should be ready to go out by the end of next week if we keep having this great weather. 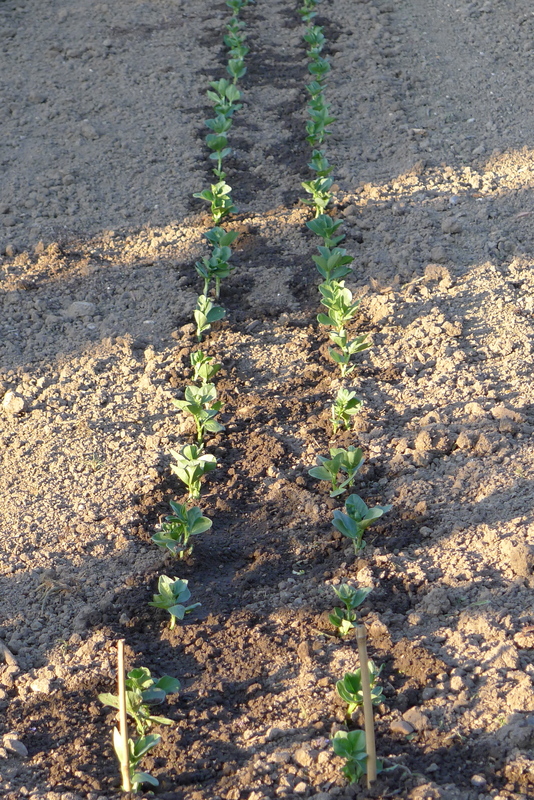 I have just moved my Broad Bean ‘Aquadulce Claudia’ from Mrs Nextdoor’s glasshouse into her cold frame to get them ready to go out in the garden, either at the end of this week or very early next week (it should be this week ready), I planted the seed in plug trays on 12/03/13 in put them under glass in our nursery, they did not move so I took them to the glasshouse next door, they started to come up, I now have very handsome plants and just need them to get hard so they can go into the garden. It is important at this stage not to have them stop growing, they will do this if they are in the plugs too long. The next stage has started after seed sowing, pricking out the seedlings, I wait till the seedlings have their second leaves. 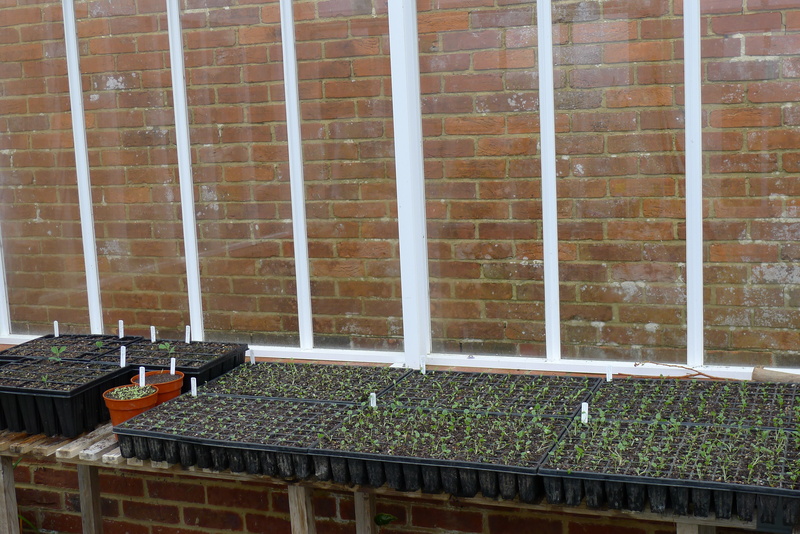 I am pricking out all the seed that where sown on the 13/03/13, we move them from the five inch pot (that all the pack of seed seed was sown in), to the plug trays, there are 98 plugs in each tray, I am pricking out a plug tray of each, they will go from the plug to the garden after some time under glass, cold frames work very well for this, you can give them air durning the day and close them down at night to keep them warm, this makes sure they keep growing. Of the seven rows of seed I planted on 08/04/13 one row has come up, it is the Lettuce ‘All year round‘ from Moles Seed, I am a little worried that more has not come up, I may need to cover the area with fleece as we had two nights of frost on the weekend, this is the side of life in the garden that can be so hard to get right, the weather. Those of us that work the soil talk and think a lot about the weather, living on an island such as England makes changers in weather a big part of life. I am happy to say that the seed that I planted in pots and put in Mrs Nextdoor’s glasshouse has come up, they where Herb ‘Chervil’ from Thompson and Morgan and Lettuce ‘Paris Island Cos’ from Moles Seed.